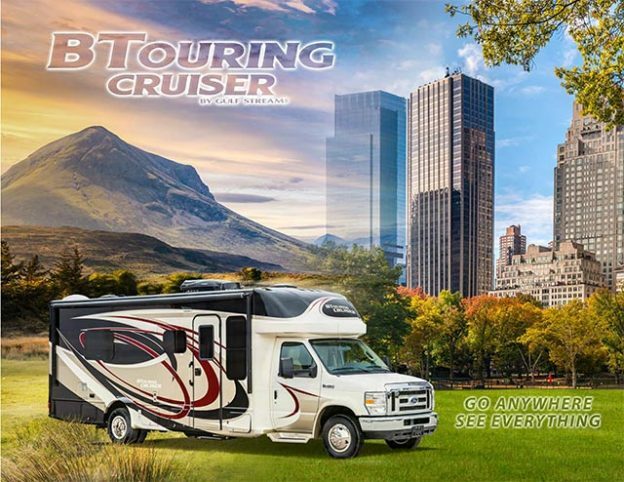 If you want the latest Gulf Stream Coach floor plans, specifications, features, and photos, take a moment to download the newest e-brochures from the Gulf Stream Web site. The new brochures are color PDF’s, which look great on screen, download quickly, and print well on your desktop printer. Headed to an RV show or dealer? Be prepared! Choosing a new travel trailer or motor home means assembling a lot of information and making a lot of choices. That makes it smart to check out our e-brochures before you head to the next RV show or visit your local RV dealer. Our e-brochures have an easy-to-read table that includes the latest dimension data – Length, width, weight, tank sizes, and more. They also show current floor plans side-by-side, so you can compare living spaces and sleeping arrangements. Key too is the latest list of standard features, packages and options. That’s your guide to getting exactly what you want in your new RV. We highlight construction features and materials in our brochures, too. That helps you understand all the unique steps we take to make our RV’s more reliable, durable, and safer. Finally, e-brochures provide a great showcase for pictures of our RV interiors. Brochure pictures let you study our RV’s, so you can decide how you’ll make use of the spaces and features. Do your homework before you go! Of course nothing can replace the fun and functionality of exploring new travel trailers and motor homes in person. (Use this link to find dealers near you.) Whether you visit an RV show or a dealer near you, you’ll have an experience that no brochure can provide. But don’t head out of the house without doing a little homework – Take a look at our online e-brochures. You’ll find a link to our e-brochures at the top of every Brand page. Just click the “Get A Brochure” button near the top of the page. Once you’ve chosen a model on the site, the e-brochure is also posted under the “Features” tab. Finally, all e-brochures are on our “Download Center” page under the Company Info and News tab in our Main Menu. This entry was posted in News on April 1, 2019 by pcampbell@gulfstreamcoach.com.